Welcome to 2/90 Sign Systems!Healthcare Signage Solutions | Welcome to 2/90 Sign Systems! 2/90 Sign Systems is experienced in directing people through and around healthcare facilities. Easily maintained, our wayfinding systems work in harmony to ensure no one is without directional aid, creating a positive environment for patients, visitors and staff. 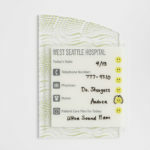 Architectural communication solutions positively impact a patient’s perception of their hospital experience. 2/90 Sign Systems provides solutions to increase HCAHPS scores ensuring your hospital receives Medicaid dollars. 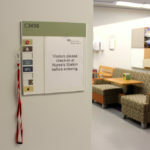 VitalSign is an architectural sign solution for communicating critical care information to hospital staff, visitors, and patients. InfoBoard™ is the dry-erase board that reflects your brand and matches your other signage.